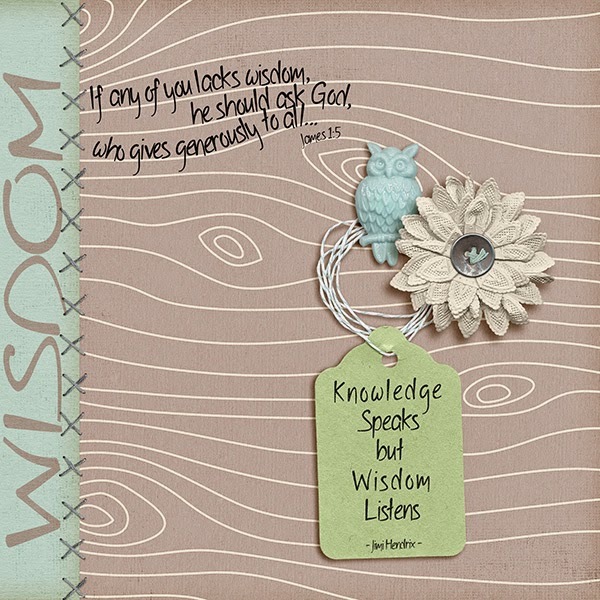 Please visit Patter's blog HERE to read her devotional thoughts centred on the chosen word "Wisdom" for this fortnight's challenge. The day I read the challenge details and devotion was the day my husband and I do a Bible Study with our neighbour across the road who is a quadriplegic man in a wheelchair living with his elderly mother. He has carers come to his home to get him out of bed in the morning and then into bed at night ( his mother is not capable of doing this - she is in her early 80s). David is a Born Again Christian and delights in Ken and I doing these studies with him - God was definitely in control with our decision to move to this little town. Back to the theme "Wisdom" that afternoon in our study we just happened to come across the verse in James that I have shared on my artwork. God's perfect timing. When looking for a quote to include on my page, once I saw the one I have used... I just had to use it as my word for this year is "LISTEN". A wonderful page ! Lovely colours , are the flower and owl digital too or added later ? Love the background! wonderful story and LO to match! Love the way you did all the texts! Wow! That verse hit me between the eyes. I sure do need to listen. The softness of your card and the colors are so pretty.